I'll be the first to admit that I was late getting in to this tv show. I'm sure you've noticed how every so often you get these brilliant, top notch shows popping up and then not receiving the attention they deserve. Remember when all your friends were telling you to watch the likes of Arrested Development and Entourage? 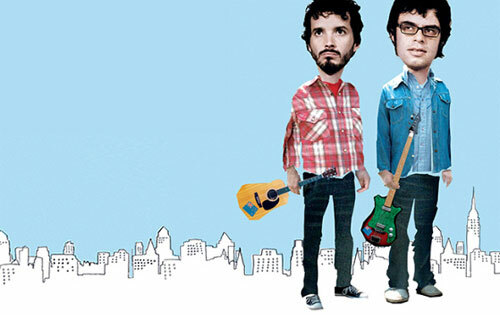 Well this is the next heir to that throne, Flight of the Conchords is bloody brilliant. Despite an abundance of critical acclaim and nominations at both the Emmy and Grammy awards (winning the latter), comedians/rockers Jermaine Clement and Bret McKenzie commented that although they enjoyed doing the show, having to script the episodes and write a lineup of new songs each season was far too much of a strain on the two of them, which is fair enough really. “I think they will go on. “Would you stop this while it is still on this sort sort of a roll? Sounds good to me, fingers crossed boys and girls. Frankly, people love the show, they should keep writing it. I understand fully the strain of having to write new songs for the episodes, but I really don't mind waiting a year or two for the next season, shows like Entourage have done that before. They could also consider doing fewer songs, maybe 1 per episode, if that makes it easier. But either way the show deserves to go on.